In Fallout 4, the U.S. Covert Operations Manual will improve your sneak skill significantly. A total of 10 issues are distributed in the wasteland. For each of these magazine you get the perk "You are permanently harder to detect while sneaking". 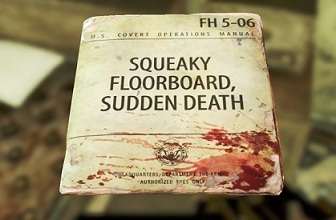 This manual can be found in an underground complex. Go toward the stairs, bend in the space to the right and go right again into the small room that looks like an office. There you will find the manual on a desk with computer terminal. East of Bunker Hill you find a ship. There you will find another edition of the " US Covert Operations Manual." Do you have the lockpicking skill, then you can go directly into the captain’s cabin and unlock the door to get the manual. Alternatively, you have a longer quest line from the robot outside the ship. Even for this mag you need the lockpicking skill. Go to the Federal Reserve Stockpile bunker, which lies in the west of the Commonwealth. Here you have to open the locked door, then run up through to the back and then turn right. Do you see a wooden staircase leading to a door, then go into the room behind it. There you can find the manual. In the abandoned cabin in the southwest you will find access to an underground facility. Go in and walk up to the rear. Then turn left and follow down the stairs. Run through the big room to the rear and then again take the stairs down. Once there you will see the manual on one of the computers on the left. If you have completed quests for the Brotherhood of Steel, you will come to Fort Strong. This is located in the eastern part of the Commonwealth. Immediately to the right there is a door. You have to unlock it. Once you succeed go inside, you'll find the manual on the desk. As part of the main quest "Reunion" you will go automatically to Fort Hagen. Go inside through the roof and take the elevator to go down to the basement. Manual is located in the bedroom on the nightstand. Go to the training yard of the National Guard northeast of Bunker Hill. Then you have to hack the computer. Once the door opens go through this. Go to the left and then to the barracks of the National Guard. Run up the stairs and jump down through the large hole. In a room with the flag you will find manual. Libertalia can be found in the east of the Commonwealth. Take the cable car to get into the boat. Go two floors up and then right on the edge there is a chair and a small table. You will find the manual on the table. The Revere Satellite Array can be seen from the Bunker Hill. Go to the northeast, to get there. Go up the stairs of the satellite without the dish and grab the magazine from the small table. This magazine can be found just east of Sanctuary Hills in the USAF Satellite Station. Go down the stairs and hacked the computer to open a door behind you. In the corresponding space you will find the manual on a table.